I first joined Etsy in 2007. Phew, seems like an eternity ago! Over the years I have favorited hundreds of items and sellers. Back then, there wasn't a possibility to organize your favorites and my list of items I love has become a huge mess- a pretty mess, for sure, but not a convenient one. I am thrilled to finally have a sleek, organized way of collecting my favorites. 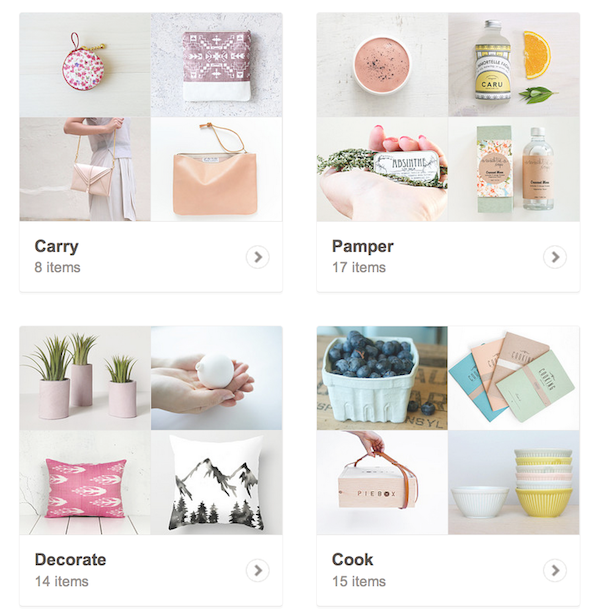 Etsy Pages is a platform that allows brands, bloggers, and magazine editors to keep track of their favorite items and designers, and share their picks. It's a new way to explore the Etsy marketplace, and I am excited to be part of it. If you'd like to see my favorite Etsy finds, you can find my page right here. And if you haven't already, be sure to check out the other curated pages before your next indie shopping spree. Oh, and if you have an Etsy shop, please feel free to leave your url in the comments- I'd be thrilled to check it out. I love Etsy! When i nee dinspiration i always look on Etsy. Me too! There are so many talented people over there. Very cool. I haven't logged onto Etsy in a while because everytime I do, I spent hours and hours on it! No bueno. But I'll have to check this out. Thanks for sharing! Haha, I can definitely relate to that! It feels SO good to finally have everything organized! You'll love it! Thank you for this lovely selection. I will certainly add some items to my favorites. Glad you like it Jana! I love Etsy wishlists - I organise mine as gifts for people as I'm always spotting things that will be perfect for my family and friends. The only thing is that it doesn't seem to be possible to see your lists of items from the Etsy app! I'm an ETSY addict, it used to be my pinterest! Hahaha! Would love if you got to check out my Etsy!